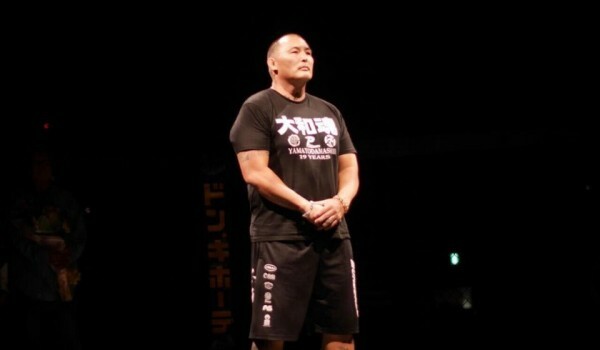 Last month, Enson Inoue was honored in a retirement ceremony at Vale Tudo Japan 6 in Tokyo, putting an official end to possibly the most unique of MMA careers. A Honolulu native, Inoue left the University of Hawaii to further a racquetball career in Japan in the early 1990s– eventually turning up at a tryout for the seminal Japanese MMA promotion Shooto. Inoue, who had trained extensively in Brazilian jiu-jitsu with Relson Gracie back in Hawaii, was hoping to test his own fighting spirit for one fight. But he essentially never left Japan, or fighting, behind. One fight led to another, and Inoue became a legend: known as “Yamato Damashii,” the spirit of ancient Japan — a man whose “never say die” attitude brought the samurai spirit back to his adopted home. Similarly, his retirement ceremony was at once traditional, and unconventional. In a brief speech, Inoue described his parents as “teaching the way of Yamato Damashii” and “showing the meaning of integrity” before presenting them each a bouquet. Enson had thought the ceremony would happen at a Shooto show, where MMA bouts still take place in a ring, like the ones where he cut his teeth in the 1990’s. But it was decided to have it at a Japan Vale Tudo event instead, which uses the cage more common in today’s MMA scene. That Randy Couture bout at Japan Vale Tudo 1998 is remembered by many fans as Inoue’s greatest fighting moment. 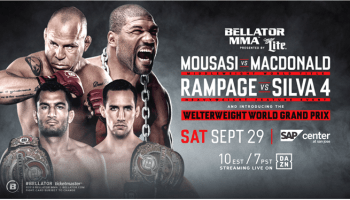 Couture was regarded the top heavyweight in MMA when Inoue scored an armbar submission victory that night. But, Inoue disagrees. His journey in martial arts was highlighted by his defeats — the times he grew spiritually fighting valiantly against the likes of Igor Vovchanchyn and Rodrigo Noguiera. 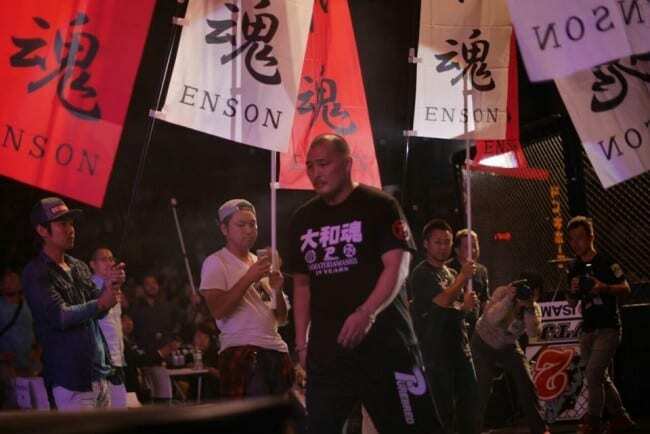 Enson Inoue exits the cage following his retirement ceremony at Vale Tudo Japan 6 in Tokyo, Japan. Inoue always described his fighting career as a step in his journey “to become a man.” In recent years, he also tested his resolve in a lengthy pilgrimage, all on foot, of the 108 Buddhist temples in Shikoku, Japan. Inoue has been busy lately with trips to Japan’s north, where many are still displaced by the typhoon disaster of 2011. There’s time for a little fun, too. Inoue recently appeared in a brief scene on the television series “Hawaii Five-0” in a turn of events that surprised him as much as anyone. 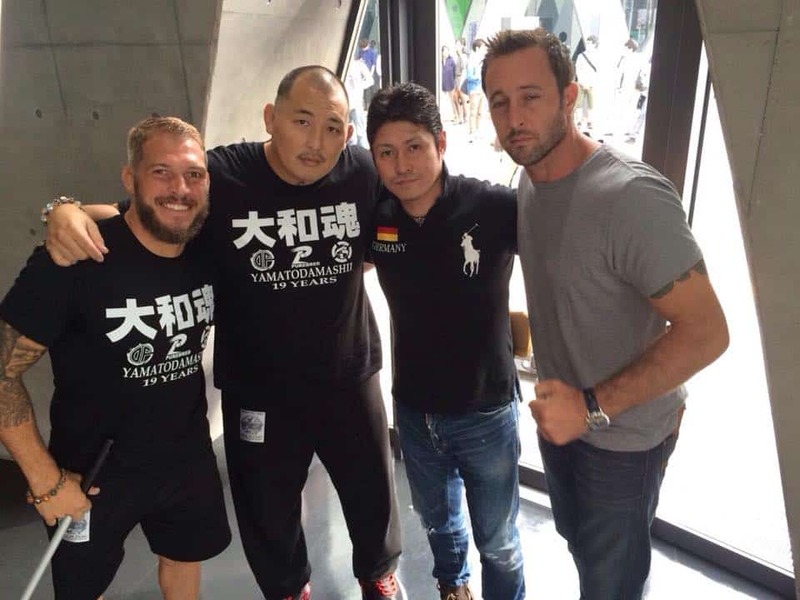 Inoue’s older brother Egan trains the shows’ stars, Alex O’Loughlin and Scott Caan, in jiu-jitsu, and had already appeared on the series — along with other former MMA standouts like John Lewis and Chuck Liddell. Following his retirement ceremony, Enson Inoue celebrates with friends, including jiu-jitsu champion Michael Fowler (far left) and actor Alex O’Loughlin (far right). To learn more about Inoue’s work in the North of Japan, please visit his site Destiny Forever, or this GoFundMe page.